You are here: Home / Weekend Workshops for Kids! 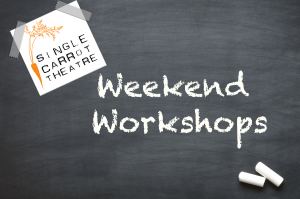 Every year, Single Carrot Theatre offers weekend workshops for kids (Ages 5-11). Seasoned professionals from the company and community will lead unique and fun classes that cover the full range of theatrical skills and performance. Weekend Workshops will take place at the theatre at 2600 N. Howard Street on the 3rd Saturday of selected months. Admission is $5, drop in. Stay tuned for more information about our 2018 Weekend Workshops; coming soon! Learn all the tricks and treats for spooky, fun, and silly stage make-up! Join us on an adventure as we create a new spin on traditional fairytales. Learn to move like an actor, create characters, and explore theatre through movement exercises and games. Explore the funny, physical world of a form of masked theatre performance known as Commedia Dell’Arte. An introduction to Broadway-style dance and performance for musical theatre lovers. Use your arts & crafts skills to create your very own sock puppet. A fun and fresh dance class featuring the latest and greatest hip-hop moves!